Mango I has 3600 square feet living area. The spacious, ONE-LEVEL floor plan comfortably accommodates large groups and makes it one of the most sought after rental properties in the Destin/Panama City area and especially on Hwy 30-A. This property has 6 large bedrooms that each have their own full private bathroom. The living area, dining area, and gulf balcony are each large enough to accommodate your entire group of 18 at one time. The living area has a 55" FLAT SCREEN TV, IPOD/IPHONE/CD stereo dock, DVD, and DVR. We have family movies and books,children's books, games and puzzles. We have WIRELESS INTERNET throughout the house. Five of the bedrooms have king size beds. The sixth bedroom is a large bunkroom with two bunkbeds with 4 double size mattresses. Each bedroom has its own private full bathroom and TV. Two of the king bedrooms have whirlpool tubs and share a private balcony. We can accommodate your infants with pack and play cribs if you will request it. Mango I occupies the middle floor of Mango Mansion. Mango II (vrbo 6527) occupies the top floor with an identical floor plan. The ground level is covered parking under the house. If your group size is up to 18 people, book either Mango I or Mango II. If your group is 19-36 people, book both floors and enjoy the luxury of being all under the same roof in this magnificent house! Mango Mansion is located about 1-2 miles to the east of Seaside Village on the beachside of Highway 30-A (no crossing the street!). The beach is about 30 yards away via our private walkway. Mango Mansion has a private pool which only Mango I and Mango II share. A nineteen mile paved bicycle/walking path crosses our driveway. Bike rentals are within walking distance. Come enjoy the spectacular Gulf of Mexico and partake of all the amenities the world's most beautiful beaches have to offer! The entire Seagrove Beach area is convenient to a wide variety of beach activities including water activities, shopping, dining, and entertainment. In addition, you can access a paved walking/bicycling path from our driveway that runs for miles east and west along Hwy 30-A. beach and pool toys included for use at Mango! Save time and space on trying to pack them! If you would like to have your groceries in Mango and cooled by the time you check-in please email about scheduling. This is great, you can grocery shop from home and we will pick up and place the items in your vacation rental for you. Mango 1 was a perfect house for our families vacation. First just having your own bathroom was beyond heaven, no sharing! The kitchen is probably the most well equipped I have ever had in a rental home as well as beach supplies. The family gave us a nice welcome gift as well. The view is only a partial view of the ocean but in reality we spent our entire day everyday on the beach. We were very comfortable. Best Vacation My Military Family Has Had! My family has stayed at Mango l twice. Once in 2015, and most recently in July 2017. My husband is often deployed, and we don’t much time together, so our vacation time and the location is important to us. Mango l was spotless upon our arrival. I am a clean freak, and this rental was up to my standards! There were also gift bags waiting, and a cot that we requested all made up with clean sheets, and blankets. Not knowing the area, we contacted the owners, who made great recommendations for local family fun, and amazing restaurants and shopping. Of course, the beach and all of the beach accessories that came with the rental were a highlight as well. I am currently in touch with Mrs. Brown, scheduling our next trip. 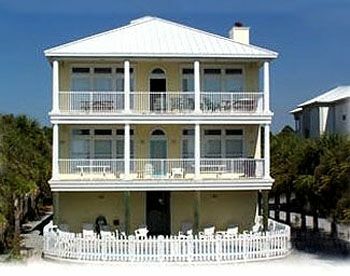 Mango II of Seagrove, a mansion yes but in need of upkeep and cleaning! Prick your hearts, deception at its best. Our family stayed here for a full week and had a fabulous time. We found everything about the house and the location to be absolutely perfect! We love to cook and were pleased the kitchen was well stocked with dishes and cookware and utensils. We enjoyed being able to all eat together in the large dining area. There were even toddler dishes, a high chair and a booster seat for the little ones. The house was neat and very clean and very tastefully decorated. We spread out and used all six bedrooms and appreciated the luxury of having a private bathroom with each bedroom. We thoroughly enjoyed the beach and the private pool which was sparkling clear and wonderful. The beach was so convenient as it was just a short walk out the back and down the private boardwalk. There was even a bin full of beach toys and chairs for us to use. The Simmons family was real easy to work with and so accommodating. They provided us with 3 pack "n" plays plus linens for our babies. The gift bag they left us made us feel very welcome. We enjoyed ourselves so much we have already book another week at Mango. We can't wait to return. We had a horrible experience at Mango 1. Not on the beach like the discription leads you to believe. There are 30 steps to the beach. No water view. View only of a parking lot and very close to a road. The place was very dirty upon arrival. We found mold, sticky stuff on the floors and used dental floss on a night stand. Parts of the ceiling is falling down over the master bed. Yes there were also cockroaches. We spent most of the week cleaning and setting roach traps. I would not recommend. Please note:The individual who wrote this review is NOT the individual who rented the unit from us. It sounds as if he was quite displeased and that is very disappointing to us. Mango is truly our personal home away from home as we live only a little over an hour away.In fact, we had just spent a week there seven days before this rental.We found the house clean and pleasant as usual. Mango has been listed with VRBO for almost fifteen years now and we have a guest book with well over 300 letters from folks telling us what a great time they had! Many of our guests send us photos of their time at Mango and some even share Christmas cards with us. We find it rewarding to know that our home is filled with family fun and laughter while we are away. Most of our guests are repeat renters. In fact, after just their first visit, both the folks who rented shortly before this rental and the folks who rented shortly thereafter have now decided to become repeat renters as well. We are excited to add them to the "Mango Family"! Just to be clear about location: We are located on the beach side of Highway 30A in an area known as the Beaches of South Walton. Specifically, we are located in Seagrove Beach. There is one house located between us and the beach front. If you truly want to enjoy all the amenities of a family home, round up your family and come visit us! All linens provided EXCEPT for beach towels. Damage deposit is fully refundable. Additional deposit required for spring break. We can accommodate infants with pack and plays.